When you save a file for the first time or attempt to open a file, Office 2016 applications steer you to the Documents folder on the assumption that you keep most of your files in that folder. 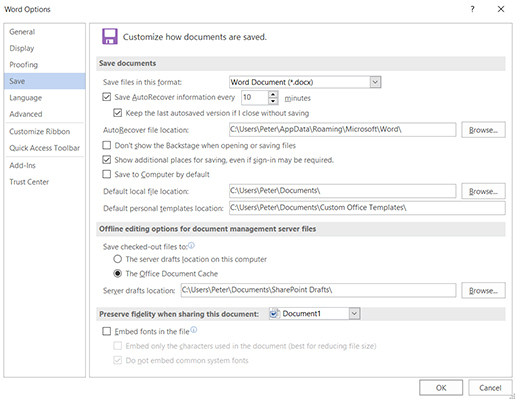 The Documents folder is the center of the universe as far as Office 2016 is concerned, but perhaps you keep the majority of your files in a different folder. In Word 2016, Excel 2016, or PowerPoint 2016, go to the File tab and choose Options. You see the Options dialog box. In the Default Local File Location text box, enter the address of the folder where you prefer to keep your files. For example, if you’re fond of keeping files in the My Stuff folder on the C drive of your computer, enter C:My Stuff or click the Browse button (if it’s available) and select the My Stuff folder in the Modify Location dialog box.